OK, so you’ve decided to put on your best poker face, load your pockets with some cash and head out to the local casino for a few hands of poker. With plenty of live and online venues to choose from in Canada there’s always a chance you’re going to find the perfect game; however, if you don’t have a perfect strategy for said game then you’re never going to get the most out of your session. Indeed, while the games inside Fallsview or River Rock might be frequented by players with a questionable amount of talent, the road to success is never easy in poker. Thanks to the looming presence of luck, even the worst players can win at any given moment, so you need to have a strong strategy in place before you ante-up. In this strategy article we’ve decided to take a concept familiar to blackjack players and outline why you can use it to bolster your poker arsenal. Whenever you navigate to your favorite online blackjack site, whether it’s 32Red Casino, Titan or Lucky247, or a live venue, the one thing you can do to swing the odds in your favorite is card counting. First used by MIT professor of mathematics Edward O. Thorp, card counting during a game of 32Red blackjack allows you to ascertain the dynamics of the deck to see if things are in your favor. On a basic level, card counting involves creating a running count which is the sum plus and minus numbers. For example, each time you see a card with a value between two and six, you need to add one to your running count. According to Thorp‘s theory, each time a card with a value between 10 and Ace is dealt then you must subtract one from your running total and if a seven, eight or nine are dealt, you don’t do anything. After building up a running count for a number of hands, you then divide your running title by the number of decks left in the dealer’s shoe to get a true count. Based on this number you can then get an insight into whether the decks contain a higher concentration of high value cards or low value cards. When there are more high cards the savvy blackjack player will up their bets in order to capitalize on a situation that’s seen to be +EV. OK, sounds great, but how can I use this at the poker table? Before we explain that, it’s important to state that for this article we’re focusing on stud poker; however, the core concept can easily be applied to all forms of poker. Essentially, the point we want you to take away from this article is that card counting when you’re playing blackjack on sites such as Titan, 32Red or even one of Canada’s live casinos such as Fallsview, involves focus and reading the deck. To accurately count cards you need to keep a mental record of every card that’s been dealt and use it establish when the deck is in your favor. 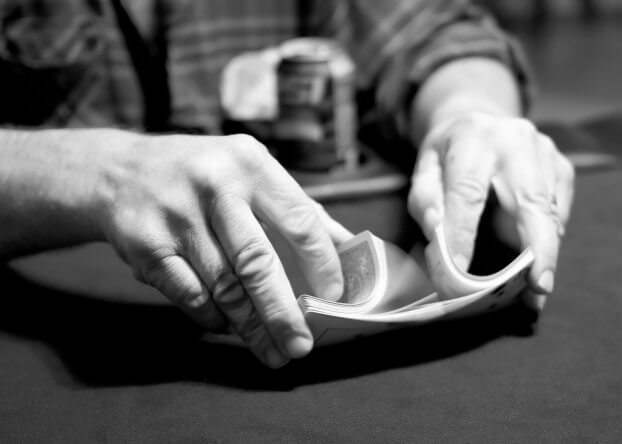 In a game of stud poker, your opponents’ cards will be out there for all to see during a round of betting. During a game of stud poker, four of your cards (and your opponents’) will be dealt face up and this means you’re able to take note of what cards have left the deck. Many novice players tend to focus solely on their own hand in a game of stud and forget what’s already been dealt. Doing this essentially forces you to play a hand at 50% of your normal capacity because you aren’t benefitting from all the information available to you. Because certain players will fold and others will play their hand until the end, you need to constantly watch everyone at all times as a priority. As the cards are being dealt on each street you should never look at your cards first; instead, make sure you check, note and remember every one of your opponents’ cards. Of course, at first this will be tough as there are a lot of variables to try and remember; however, if you want to become a strong stud player then it’s something you need to do. To help with the process of tracking and remembering you can develop a system similar to card counting. Although you won’t need to perform any calculations at the table, you can assign numerical values to certain cards. For instance, any picture card can be given a value of one. Each time you see a picture card dealt you can continually add one and when it comes time to make a decision you can refer to your count in order to aid your decision. For example, if you found yourself on fifth street with a count of five, then you’d know that five pictures have been dealt and that there are (theoretically) 11 left in the deck. Going through this process at the poker table each time you play will gradually increase your ability to track and remember cards and, eventually, you’ll be able to simply remember specifics. Once you can do that your game will improve dramatically as you’ll be able to work out when your opponents are bluffing, when they are strong and what cards are left in the deck to help your hand. Blackjack might not seem like the most obvious game to find strategy advice in, but if you’re willing to count cards, then it can dramatically improve your poker skills.